The December 13 FOMC meeting is the last one for Fed Chair Janet Yellen that involves a press conference – the January FOMC meeting will just see a press release - ahead of handing the Fed Chair role to Jay Powell in February. Given the economy is in much better shape than it was when she took over from Ben Bernanke and the fact that she is both hiking rates and shrinking the Fed’s balance sheet, Yellen can take immense satisfaction from the job she has done. In terms of what to expect, markets widely anticipate a 25bp hike, after which we suspect she will sound a cautiously optimistic tone but offer little in the direction of future guidance to give incoming Chair Powell maximum flexibility. With 3% annualised growth in the second and third quarter of 2017, business surveys suggest the 4Q figure should be just as strong. The combination of robust domestic economic activity, an improving global backdrop and the prospect of meaningful tax cuts mean that 3% is now a realistic possibility for 2018. Inflation is below target, but here too we think there is movement with dollar softness pushing up import costs, a tight labour market suggesting upside risk to inflation and the housing component starting to exert upward influence. Given this backdrop, we see broad support for a December hike within the FOMC. There is more work to be done though. Even after this hike, we are looking at an economy that is growing at 3% and has inflation of 2% yet the Fed funds target rate will be just 1.25% (lower bound). 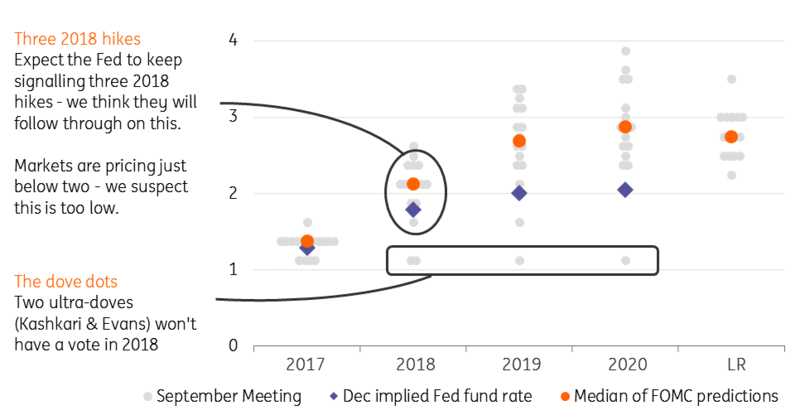 Currently, the Fed funds futures market is only fully pricing in one additional 25bp rate rise in 2018, despite Federal Reserve officials signalling they think three rate hikes is the most likely path for policy. While we understand market reticence given the Fed has told us in the past that they would hike and then not carried it through, the US expansion is already amongst the longest on record, and the fact inflation remains low, we have much more sympathy for the Fed’s view than the market’s position right now. Officials have cited the fact that the yield curve is the flattest it has been since the financial crisis and the dollar’s weakness this year means that financial conditions are loose. This suggests they need to do more work at the short-end of the curve to perhaps make monetary conditions more optimal for the US economy. Several key officials have begun to sound the alarm over “somewhat rich” asset prices. 20 years ago when Alan Greenspan was the Fed Chair, he suggested that it wasn’t the Fed’s job to burst bubbles. The Fed was there to clean up any fall-out. This was fine when interest rates were 6%, and the Fed’s balance sheet was relatively small. However, now they have much less ammunition to support the economy if a crisis hits, given interest rates are closer to 1% and the balance sheet is US$4.6tr. This means they perhaps now need to be more pre-emptive to prevent bubbles forming in the first place. There is clearly some nervousness that the prolonged period of ultra-low interest rates has changed household and corporate behaviour and could lead to increased leverage with “adverse implications for financial stability”. This too suggests the Fed is more inclined to take earlier action to reduce the chances of problems forming in the future. A final reason that leads us to believe the market is being too cautious is that the voting committee of the Federal Reserve is changing. Janet Yellen is leaving the committee in February meaning there will be four vacancies amongst the seven-member Board of Governors. At the same time the alternate voting members are changing with two of the most dovish FOMC officials no longer voting – Neel Kashkari and Charles Evans - are to be replaced by two relatively hawkish figures in Loretta Mester and John Williams. So, given the Fed has broadened out the arguments for higher interest rates and there is a smaller voting committee with a more hawkish tilt to it, we are now forecasting three Fed rate hikes in 2018 followed by two further hikes in 2019. We suspect the balance of risks lies to the upside.